Garage doors are prone to get broken as they are used daily by various members of the family. One of the most common problems that people face is with the garage door springs getting broken or damaged with constant use. Call us as we offer you the best services with state-of-the-art technology, which will be delivered to you in a fast and efficient way by experts who have been working with thousands of garage doors on a daily basis. We are the reputed experts in Broken Spring Repair services and we attend all calls as we know that a malfunctioning garage door is actually an emergency situation. For Exceptional Garage Door Opener and Broken Spring Repair – Call the Professionals! Do you know that your garages are the modern equivalent to horse stables? But that ends the comparison. The garages that we have today are automated and that is why we have the garage door springs. The springs help in opening and closing of the doors. These door openers have modern security devices that make your garage safe. The opening and the shutting of these is made possible of the garage springs. The spring is one of the most exhausted parts of the automated ones. It has a limited service that is why they are usually replaced. Replacement means another expense. To be able to save money, we have to take a look at first on the replacement costs. 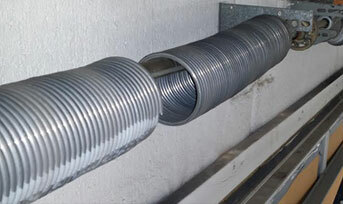 But before that, we need to know first the uses of these springs in your garage doors. The springs have to types – one type of door spring is the torsion spring. The other type is known as the extension spring. Let us first talk about the torsion spring. This is the commonly used springs for garages. The life of the torsion spring is around 10,000 cycles. This service is around six to seven years. But it will all depend how often you open and close the garage door. Every time to close and open it, the hardened steel device of the garage door will be stretched. If this happens all the time, time will come that it gets stresses and over used. This will be the time for you to replace the springs. In case only one of the springs is broken, you still have to replace both – that is the standard operating procedure for the garage doors because anytime soon the other spring will break down. The extension springs raise the door through a stretching action. Its expected functionality is also until six years. There are lots of spring models that you can find online in case you want to replace your door springs now. The garage door springs are affordable and if you happen to have one broken spring, replace both at once so that your door will not incur more damages.